The Widder Curry Asks: When the toilet overflows, is it a “flood”? 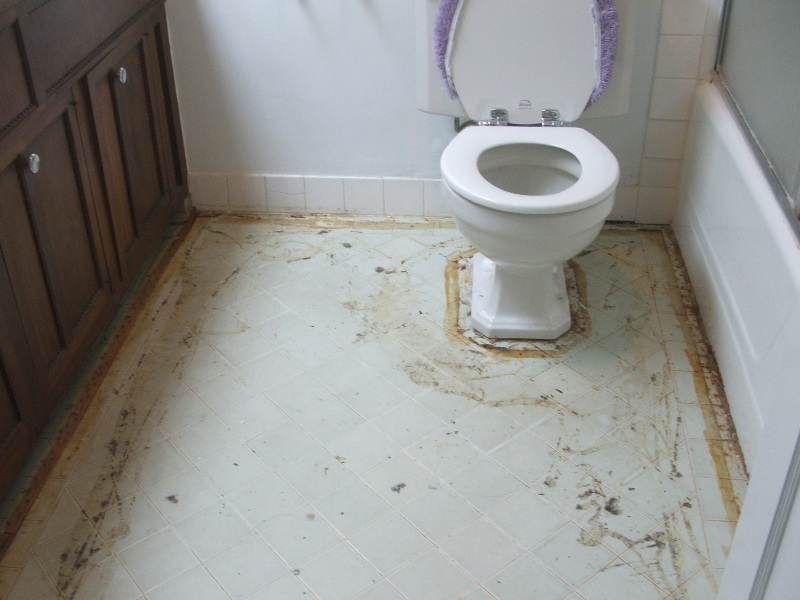 The bathroom after the “flood”. For the past few weeks, I have had an interesting situation at my house. At least once a night, maybe even twice, I hear a “phantom flush” in one of two bathrooms in the house. (I sometimes have wondered if my deceased husband has come to visit me!) It doesn’t freak me out, but it does wake me up, and since I have enough trouble sleeping as it is, the flushing of an “unmanned” toilet keeps me awake for the rest of the night. I happened to mention the problem to a neighbor and he said I needed a new “flapper valve.” When I looked at him blankly he told me not to worry, he would take care of it for me, and sure enough the next day he was at my door with a pretty blue flapper valve. Within a few moments he had it installed and I looked forward to a quiet night sleep. The first night was wonderful. No phantom flush. The second night was just as great – no phantom flush. I asked what she thought was happening and she said that the carpet in the bathroom was soaking wet. She thought the tank was leaking. I remembered that the date stamped on the toilet is 1950 – recently bought a new seat for it – and it did not surprise me that might be the case. Except it wasn’t. There was no water leaking from the tank. Rather, the hose from the flapper valve to the “fill valve” had come off and every time the toilet was flushed the water, instead of going down the tube, rushed out the top of the tank, spewing water in every possible direction. Consequently the carpet was soaking and beginning to smell, and, as I later found out, the wall behind the toilet was also wet. No, not just a little bit wet, but a “flooded” wet. I called Frank, my carpet cleaner, and he came out almost immediately to check the carpet. He brought this funny little tool along and every time he put in on the wall it beeped. And it beeped everywhere – behind the commode; in the cupboard; along the baseboard, etc. He told me that there was nothing that he could do to fix the problem because it would take more than just cleaning the carpet to rid the mildew and mold. He suggested I contact my insurance company. I have to admit that I was reluctant to do so. My first thought was that my rates would increase next year. But I didn’t have any alternative. If Frank (King Sweep) couldn’t rectify the problem I would have to go elsewhere. So I called my insurance company. That is what this article is really about. My car is insured with Geico; my house is insured through them but they have subcontracted the policy to Traveler’s Insurance. I gave all the information to the Claims Adjuster that I spoke to, a nice guy that met his wife in an “on-line” dating site. (Don’t ask – some of my conversations with service people are odd.) He told me that the insurance adjuster in our area would be in contact with me shortly. Shortly? Before I hung up the phone, she – Dana – from Travelers had sent me an email listing the names of three companies she wanted me to call to arrange for them to come out and see what the damage amounted to and what needed to be done to repair it. Please note the time: 4:50 pm on Wednesday. I was a little nonplussed, but made the call to the plumber – Master Plumbing – and they told me they would be out by 6:00 pm. I told them that wouldn’t work because I had to pick up my granddaughter and we were going out to dinner with house guests that were staying with me. The receptionist asked when was a good time for him to come out. I suggested Thursday morning. She said “no, he would come out when I got home.” And he did – at 10:00 pm! He also had the funny, noisy, tool, and examined the damage, and told me he would fax it to Dana when he got back to the office that night! At 9:15 am on Thursday morning, Jim was standing at my doorstep, the same little tool in hand. 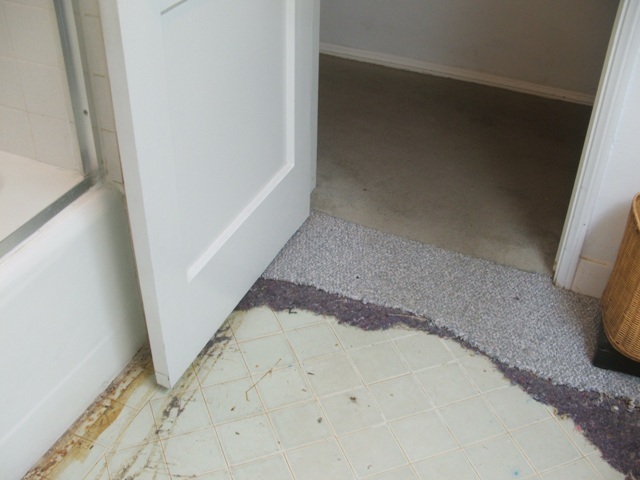 When I showed him which bathroom had the flood, he immediately pulled back the carpet and pad and checked the wall for water damage. It seems that I have an older house – 1950 – and the walls are all plaster. In a way that is good, but they were so wet there was talk of having to cut the walls out, remove the studs, and rehab the bathroom. When it was discovered that the water damage had not gone beyond the bathroom walls Jim said it might be possible to dry the walls out with fans and heaters. At 9:30 am Dana showed up and she and Jim talked over the damage, the cost to repair it, and she went back to her car to figure out an estimate, telling me that I had $1000 deductible. I said a nasty four-letter word to myself, knowing that the damage certainly couldn’t cost that much to repair, and I would have to take money out of my meager savings account to pay for it. When Dana came back into the house she informed me that the carpets would have to be torn up and replaced, along with the padding and the tackless stripping; the walls would have to be dried out; the walls repainted and the cost, not including fixing the flapper valve and fill valve hoses – all for $2468.55! I gulped, and like magic, she handed me a check for $1468.55. Told me to take it to the bank, that it was what the insurance company was going to pay me, less the $1000 deductible. Do you get the full significance of this? She was at the house at 9:30 am and handed me a check at 9:45 am? I was bowled over. But then I had cause to gulp again, because you will never guess the amount that Jim was going to charge me for the repairs. Yes, I guess you did guess it – $2468.55. He said that he always agrees to charge what the insurance estimates the damages will be. Nice, huh? He had a contract for me to sign; brought in a heater and fan that ran 24 hours a day until Monday afternoon; had a worker stop by the house and pull up the padding that had been glued to the tile floor; gave me the name of a carpet place to go to select the new carpeting, and this was all less than 24 hours after the flood. But … overall I am very pleased with the service I am receiving from Traveler’s and Restoration Solutions. I am overwhelmed to think that this “flood” was so costly; I am overwhelmed to think that I already have the monies in hand; and if I ever thought that Bob was coming back to flush the toilet just to say “hello” the next flush will see his ashes go down the drain! Yikes! Mold (or even potential mold) is a Big (capital B) deal to insurance companies – they’ll pull out all the stops to make sure to address it. When I dealt with a lot of foreclosed and/or abandoned homes, especially the ones I had in the perennially damp Bay Area locales, I used to see issues like this all the time – if they got away with anything less than cutting the bottom 18″ out of your walls and running deafening dryer fans for four days solid before sending in a hazmat crew (spaceman suits and all) to repair the damage, consider yourself lucky. That said, my wife employs a lifesaver jack-of-all-trades crew of the brothers Jose and Guillermo, who are actually certified in mold abatement (asbestos and lead too) who have saved my bacon way under budget on a couple jobs like this in the past. Wish I’d have known beforehand, from the photos you’ve posted they probably could have re-done the whole bathroom just using the $1500 check insurance provided. Thanks for the info, Dave, even though it is a little bit too late. I have put the info in my “handyman” box and maybe calling on you and your wife for more info. After all, I have two more bathrooms! That woman Widder Curry sure keeps San Diego busy. These services seem to have finally figured out that faster service is less costly for them. just out of curiosity… do you think your neighbor (when replacing the flapper) accidentally knocked loose the hose from fill valve to the overflow tube? Good question, Michael. I don’t know. I don’t know when the toilet began leaking – from the top, no less, because the students didn’t tell me about it for some time. (The toilet had to have been flushed many times for the carpet and walls to get so wet.) I am sure that everything is a possibility – except, maybe, Bob visiting in the night and using the john. Certainly I have thought of it – as has my editordude – but I just don’t know. Thanks for your interest. I would have posted sooner, but I was on the phone with the plumber.